A few years ago, Broadcom had a pretty nice chip – the BCM2835 – that could do 1080 video, had fairly powerful graphics performance, run a *nix at a good click, and was fairly cheap. A Broadcom employee thought, “why don’t we build an educational computer with this” and the Raspberry Pi was born. Since then, Broadcom has kept that chip to themselves, funneling all of them into what has become a very vibrant platform for education, tinkering, and any other project that could use a small Linux board. Recently, Broadcom has started to sell the BCM2835 to anyone who has the cash and from the looks of it, real Raspberry Pi clones are starting to make their way into the marketplace. Other Raspberry Pi clone boards out there like the Banana Pi and the HummingBoard don’t use the same BCM2835 found in the Raspi and the new Odroid. The new board also has the same 26 pin GPIO expansion socket, and runs the same binaries as the Raspberry P;. It is a clone in every sense, with a slightly different form factor geared towards very tiny, portable, and battery-powered use cases. Unlike the official Raspberry Pi Compute Module, the Odroid isn’t meant to be used as a system on module, shoved into any product that needs a fast-ish ARM core without needing engineers to actually design a circuit with an ARM. The Odroid is a cut-down, extremely minimalist version of the Raspi, perfect for any project where space is at a premium. 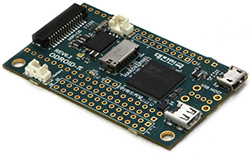 There are a few interesting features included on the Odroid: there’s an on-board battery connector, a real-time clock on the board, and more of the BCM2835 GPIOs are exposed (although not the same ones as the upgraded RPi Model B+). There’s no Ethernet, but odds are if you’re building something that’s battery-powered, you won’t need that anyway. As far as price goes, you can pick one of these Odroids up for $30 USD, with $9 shipping from South Korea. That’s pretty comparable to the price of a real Raspberry Pi, but if the features in the Odroid are worth it to you, it might be a worthwhile clone.